The Temple Beth Am Brotherhood is a separate nonsectarian fundraising arm of Temple Beth Am. The group is managed by a Board which consists of a President and numerous Vice-presidents, each responsible for specific areas. Several of the Vice-presidents manage a subcommittee to assist in the work of that group. The cornerstone of Brotherhood activities consists of nine monthly Brotherhood breakfasts held every year from September through May. Each breakfast consists of an extensive forty-foot buffet brunch prepared by the Brotherhood kitchen crew and a guest speaker. Programs in recent years have included Congressman Barney Frank, Speaker of the Massachusetts House of Representatives Robert DeLeo, Director of the Mass State Lottery Michael Sweeney, Red Sox announcer Tom Caron and WBZ’s Dan Rea. The breakfasts have also hosted a variety of authors as well as political debates. For a complete and up to date listing of all Brotherhood events check your current TeBeam or the Temple calendar. THE FINAL BROTHERHOOD BREAKFAST OF THE SEASON IS ON MAY 19, 2019, AND WILL BEGIN AT 9:00 AM. Brotherhood membership is not restricted to Temple members; membership is open to the public. Membership in the Brotherhood includes complimentary admission to all of the Brotherhood breakfasts. 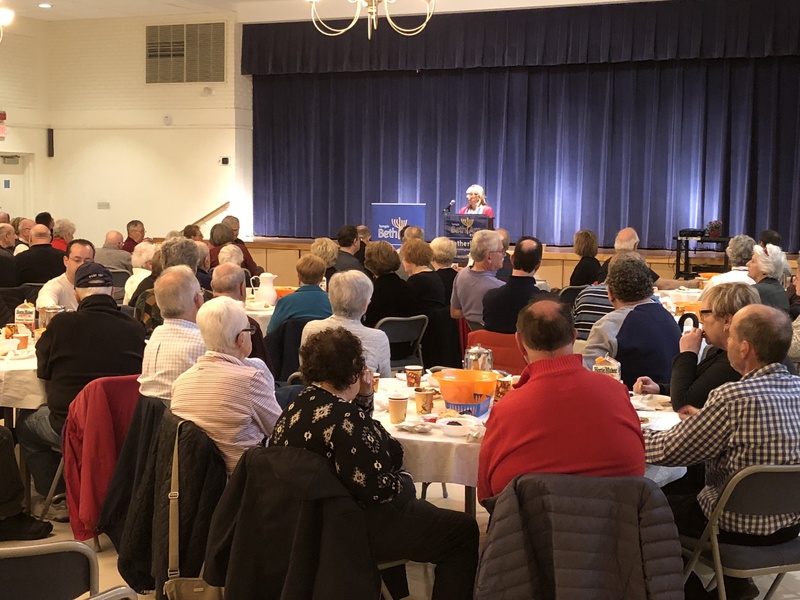 In addition to its annual memberships, the Brotherhood raises funds through guest fees received at its breakfasts, the videotaping of Bar & Bat Mitzvah ceremonies for the families, and special events planned from time to time. Funds are used to support charitable activities of the Temple and to finance capital projects of the Temple or acquire items of importance which may not otherwise be obtainable without Brotherhood assistance. To join Brotherhood, click here for the application. In recent years, projects paid for entirely by the Brotherhood include the ceramic retiling of the main Temple hallway leading from the lobby, construction of the stained glass window in the social hall dedicated to our past-President Larry M. Wolfman, replacement of the sound system in the social hall, renovation of the men’s facility, among others. You can help by taking out an ad in our annual membership directory. Click this link to access the form. The Brotherhood prides itself on initiating projects that have dramatic appeal and will stimulate membership in its organization as well as the Temple at large. A separately operated and financed entity sponsors and maintains a Basketball League as an outreach program for MetroWest area youth. The League was originally an operating unit of The Brotherhood. Nevertheless, the name Temple Beth Am Brotherhood Basketball League remains in use today.